This is a business case from a customer using our ELEX WooCommerce Catalog Mode, Wholesale & Role Based Pricing to give category discount in his shop. He want’s to give 10% additional discount when the wholesale user chooses to pickup the order from the shop. 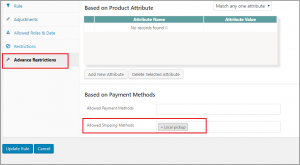 The ELEX WooCommerce Catalog Mode, Wholesale & Role Based Pricing plugin don’t have the option to give discounts based on the shipping option. You can provide discounts to products based on category or provide individual price adjustment for the user roles. or use the plugin for the tax calculations based on user roles. But discount based on shipping is not possible with this plugin, But we do have another plugin which is capable of doing this. 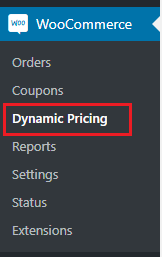 The ELEX Dynamic Pricing and Discounts Plugin for WooCommerce can give discounts based on the shipping option used in the cart/checkout page. In this article I’ll explain how to use the two plugins to achieve this. The set up and configuration is pretty simple. Business case: Give 20% discount to all categories using ELEX WooCommerce Catalog Mode, Wholesale & Role Based Pricing and give 10% discount if shipping option selected is Local pick up using ELEX Dynamic Pricing and Discounts Plugin for WooCommerce plugin. You can purchase the plugin from our site, here is the link – ELEX WooCommerce Catalog Mode, Wholesale & Role Based Pricing. Once purchased you can download and install the plugin in the WordPress Plugin page. and you’ll get the “Role Based Pricing” tab in the WooCommerce menu. Now this plugin can be used for many different purposes related to user roles. You can show or hide prices, add to cart button, or even specific products for different user roles. You can give a discount or add mark up prices to categories for user roles, and also assign individual product prices as per the roles. You can also add/delete user roles using this plugin. But in this article we’ll discuss about how to set mark up discount for the different user roles. For the current business case we need to give a 20% discount on all categories. so we can go to the plugin settings and under Role based-setting go to “Price Adjustment: (Discount/Markup)”. Here you can see the list of user roles you have and you can choose the categories for the roles you want to give discount to or if you want to give discount or add markup price to all categories you can just leave it blank. You can add adjustment to price based on percentage or fixed value, to five discount choose ‘D’ from the drop down and to add markup price you can choose ‘M’ from the drop down. Make sure you check the enable check box to apply the price adjustment. Add a 20 value under the percentage adjustment and choose ‘D’ for the user role Wholesale user role as shown below. Now for all wholesale user role you’ll get 20% discount on all products. To set up the local pickup you can go to WooCommerce Shipping Zones-> Create a zone to which you want to offer local pickup option, and add a shipping method Local pickup. If you want to offer discount on other shipping method such as flat rate or free shipping options you can add it here. Or if you need to add local pick up for multiple zones you can create multiple shipping zone and offer local pick up shipping option. Go to Discount Rules in the plugin settings and Click on Cart Rules> Add New Rule. Add the offer title “10% discount for Wholesale user on Local Pickup” or some other descriptive title. Choose the check for option as ” Total No. of Units”, and set the minimum quantity as 1, and max quantity you can leave blank if you don’t want to put any restriction. Choose the discount type as ‘Percentage discount’ and give the value as 10. Now go to the “Allowed Role & Date” and under the user-role field select Wholesale user. and the dates field you can leave blank or unchanged if you want it to start right away, but if you want a start and end date for the offer you can select the dates in the respective fields. Next, under the ‘Advanced Restriction’ tab choose the local pickup option from the ‘Allowed Shipping Methods’ field. 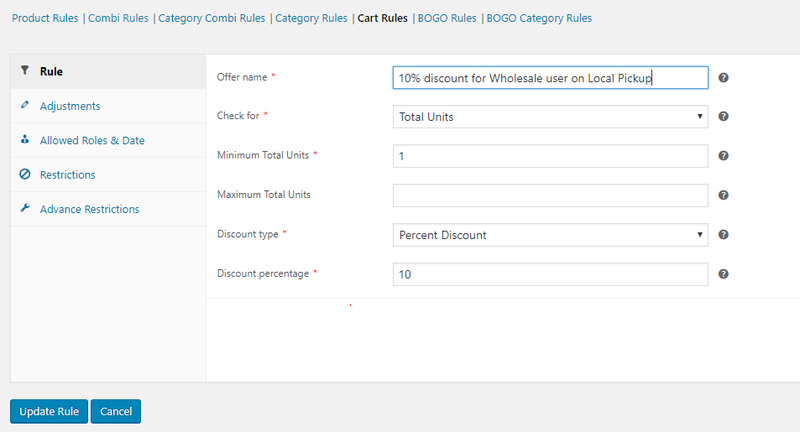 with this options the discount rule will apply only for wholesale users when they select Local pick up as shipping option, else they’ll get only the 20% discount provided by the ELEX WooCommerce Catalog Mode, Wholesale & Role Based Pricing plugin. 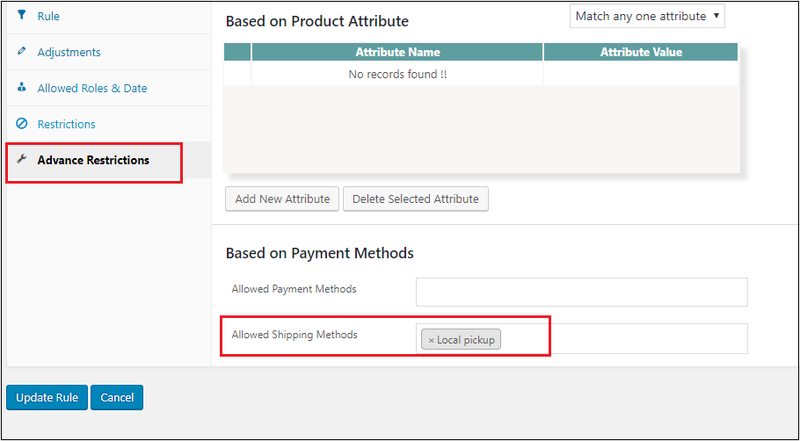 If you want to offer discount when the customer select some other shipping option you can set in the same field above. You can even restrict the rule to some payment method. Now you can see in the below image, you get only 20% category discount when the shipping option is not selected. And when you select the shipping option as Local Pick up you get another 10% discount. First the 20% category discount is applied, and then then 10% discount is applied to the product price when local pick up is selected. Hope this article have helped with your business requirement, there are so many other combinations you can use with the two plugins to achieve a lot other requirements, you can always contact our team if you have any question or doubt. You can change the discount type or the discount value, or even add a markup price and use different types of combinations.